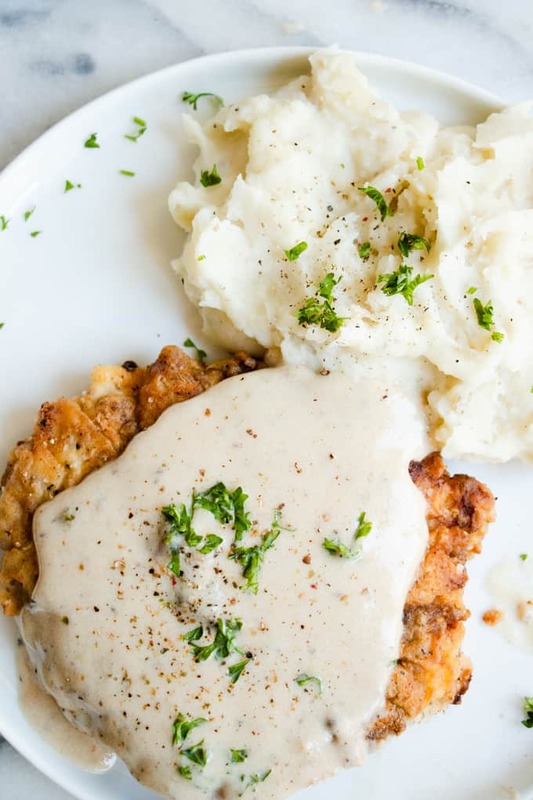 Chicken Fried Steak. The ultimate in southern comfort food! Tender seasoned steak, coated with a thick batter and fried until golden. Served with a creamy gravy drizzled on top. Simple, basic ingredients is all that is needed to bring this recipe to life in your own kitchen! 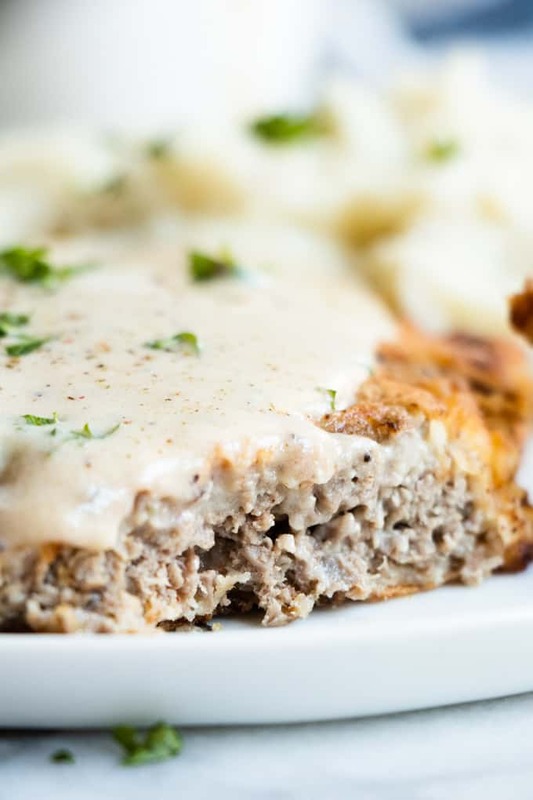 This perfect southern comfort meal of chicken fried steak is easy to recreate at home. I am sharing with you all of the tips and tricks you need to know to create a restaurant worthy dish in your own kitchen! This dish is perfect served along with some of Dad’s Famous Mashed Potatoes, or some Roasted Carrots. Finish off with some Slow Cooker Peach Cobbler for a truly southern meal. Hey y’all! It’s Serene from House of Yumm, and I am back with you today to share one of my all time FAVORITE southern comfort foods. Homemade Chicken Fried Steak. It’s a definite classic and a favorite in our home. It’s one of those meals that I don’t make all the time, so it’s a definite special treat when for the family when I do. This dish is so incredibly flavorful, with just a few simple ingredients. Most of which you probably have on hand. The only thing you will need to add to your shopping list is the cube steak! Even though the ingredients list is fairly simple, there are a few tips and tricks in HOW I make this dish that makes it even better than a restaurant. And lucky for you, I’m sharing them all below!! Get your meat ready, make sure it’s tenderized, then season both sides with salt and pepper. I like to use kosher salt and coarse ground pepper to add a bit more flavoring. Let the meat sit for about 10 minutes like this before breading. Start heating your oil in a large skillet. Prepare the dry ingredients for the breading. Whisk together the flour, salt, pepper, and paprika in a medium size bowl. In another bowl whisk together the eggs and buttermilk. Dip the steak into the flour, press the flour into the steak with the palm of your hand. Then dip the steak into the egg mixture, and back to the flour mixture. When the oil is ready, add the steaks, two at a time into a large skillet, or one at a time in a small skillet. Don’t overcrowd your pan. Cook for about 5 minutes on one side, spoon some hot oil on the top while it’s cooking. You will notice juices coming from the steak while it cooks. That means it’s cooking! Don’t flip before you see those juices. Flip the steak and continue cooking for about another 5 minutes. Once both sides are golden brown, remove from the oil and place on a wire rack over a baking sheet. Keep the steaks in the oven at 200 degrees while frying the other steaks and making the gravy. 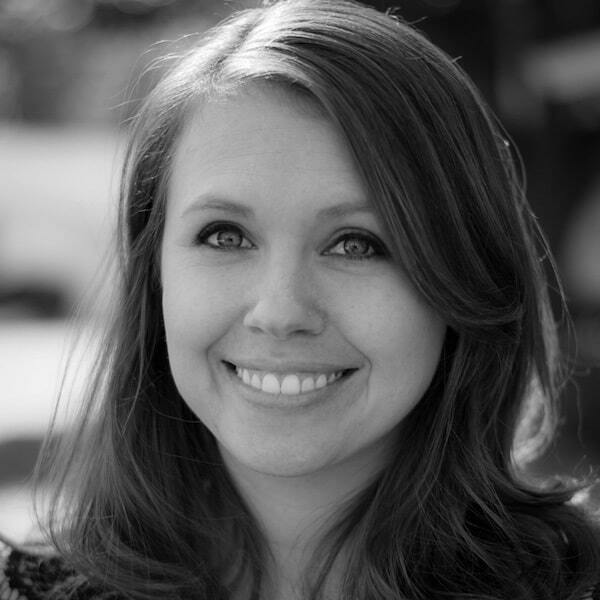 Why is it called chicken fried steak? This dish is basically a genius invention. It is NOT made with chicken. But with steak. Steak that is ultra tenderized, breaded, and then fried. Just like you would do with chicken. This dish is southern comfort food at it’s finest. 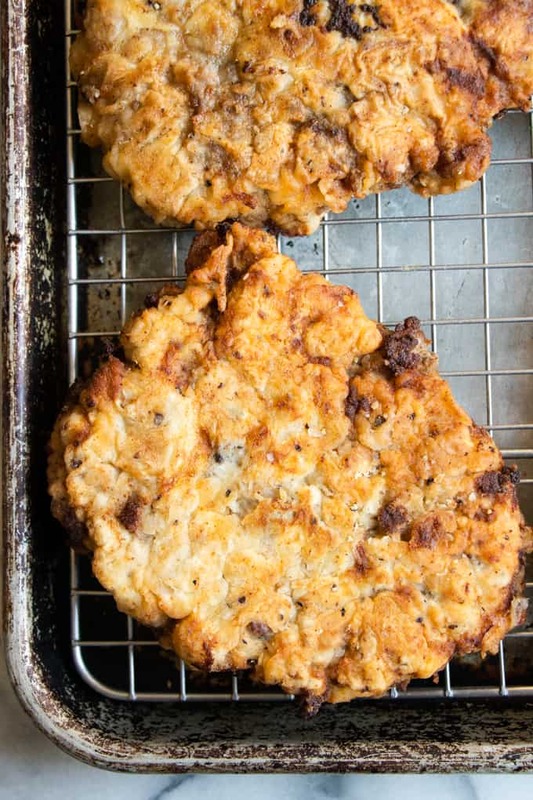 What meat do I use for chicken fried steak? 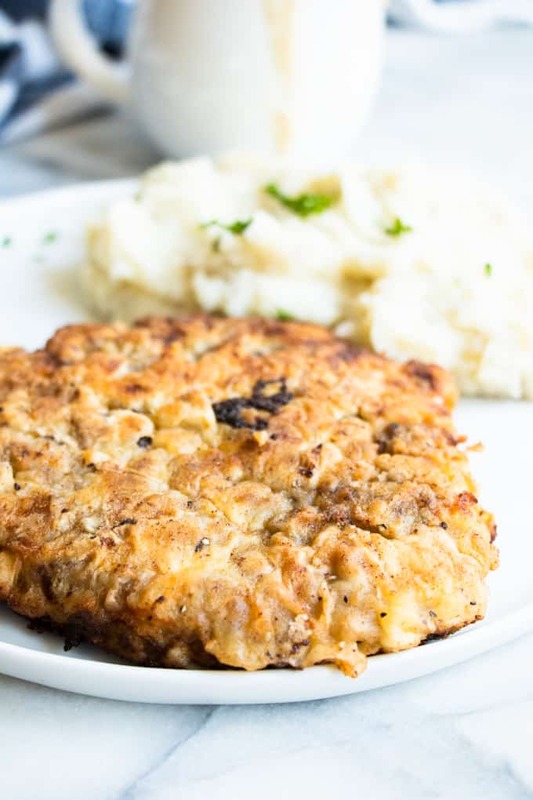 For this chicken fried steak recipe you want to go with a cube steak.This is steak that has been tenderized before being packaged. It almost looks like it has been ground, and has small indentations on the surface of it. If you are unable to get cube steak you can also use another cut of steak called Round Steak, but you will need to tenderize this with a meat mallet prior to using. Almost to the point that the meat is falling apart. 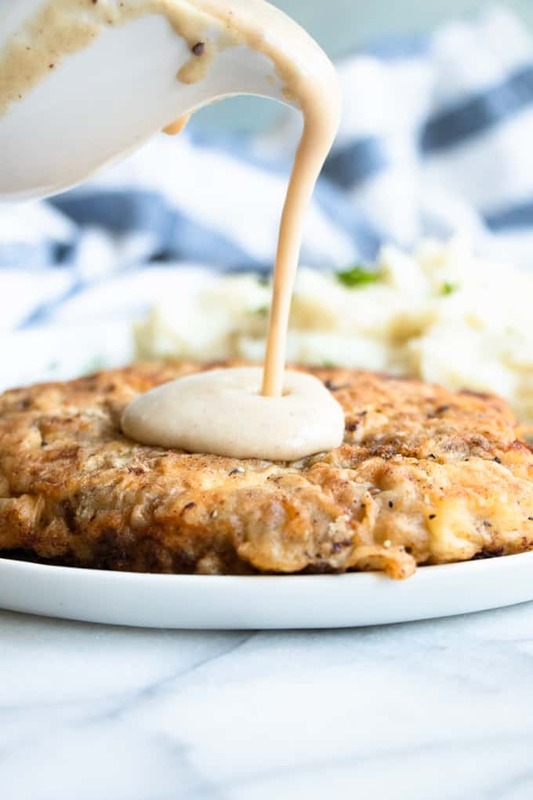 The key to making the chicken fried steak gravy, is to keep the drippings in the pan from making the actual chicken fried steak. Due to shallow frying the steaks there typically isn’t much leftover oil by the time the steaks are done. Which is the perfect amount for making the gravy. IF you have more than 1/4 cup of oil left in your skillet, you will want to pour some out. But make sure you leave all the bits and pieces leftover from the steaks! Use 1/4 cup of the drippings and oil left from cooking the chicken fried steaks. Whisk in 1/3 cup of flour. Salt and pepper. Cook the flour mixture for 4-5 minutes. The flour needs to cook, and this will get rid of the raw flour taste. Whisk in the milk. Bring this to a simmer. As the gravy simmers for about 5 minutes you will see it thicken. Taste the gravy and add more seasonings as needed. I find that it typically needs a lot of coarse ground black pepper. Salt. Salt. Salt.Trust me. This makes all the difference in this dish. Make sure that you season the meat before dipping into the flour and egg mixtures. Sprinkle a healthy dose of salt and pepper on both sides of the meat and let it sit for about 10 minutes before moving on to the dipping. I also love using kosher salt with this recipe. The grains are bigger and it gives a better seasoning to the meat. Double dip! This will give a nice thick coat of batter on your steak. When dipping the steak into the flour the first time, you want to press the flour down into the meat with the palm of your hand. This helps it stick and hold the rest of the batter from the egg and second flour dip. Heat the oil.If your oil isn’t heated enough then it won’t cook the meat through. Also keep an eye out for oil that is too hot. To test the oil toss a bit of flour into it. If it sizzles then you’re good! If it doesn’t do anything, then your oil needs to be hotter. If the flour burns, then turn it down. Shallow fry.We don’t need a lot of oil, I start with about 3/4-1 cup of oil. This is enough to coat the bottom of my pan and come up about halfway up the sides of the steaks. But it doesn’t need to cover the steaks completely. Spoon some hot oil on the steaks while they cook.This will help the batter stay on the steaks when you flip them. And only flip the steaks once, the more you flip them while cooking, the more chances for your breading to come off. Use a wire rack. Once you are done frying the steaks, place them on a wire rack that is over a baking sheet. This allows air to circulate all around the steaks, and they aren’t sitting on a paper towel soaked in oil. This keeps the breading nice and crispy and the bottom of your steak won’t get soggy. Heat your oven to 200 degrees.Place the baking sheet with the steaks in the oven after you fry them. This will keep them warm while you fry the other steaks and make the gravy. Don’t be shy with the black pepper! The gravy is fairly basic, and the overdose of fresh ground black pepper, or a coarse ground black pepper really is what gives this gravy it’s flavor. If you taste the gravy and feel it’s lacking something, it just needs a bit more pepper. Preheat oven to 200 degrees. Place a wire rack over a large baking sheet. Set aside. Pour oil into a large skillet, depending on the size of your skillet you may need more or less oil, pour enough to have the oil come up about 1/4 of an inch deep. Prepare the meat by ensuring it is tenderized, cube steak comes pre-tenderized. Season both sides of the steak with the 1 tsp kosher salt and 1/2 teaspoon coarse black pepper. Let the steaks sit for about 10 minutes. Mix the buttermilk and eggs together in another bowl. Dip the cube steaks, one at a time, into the flour first. Press the flour into the steaks. This ensures a nice coating. Then dip into the egg mixture. Let any excess drip off. Then dip the steak back into the flour mixture. Check the heat of the oil by sprinkling some flour in it, the flour should sizzle. This means the oil is hot enough. Carefully place one steak at a time into the hot oil. Don't crowd the pan, if using a large skillet you can do 2 steaks at a time, if using a small skillet only do one. Cook the steaks in the oil for about 5 minutes. Spoon hot oil over the tops of the steaks while they cook, this helps the batter stay while flipping. You will notice juices coming from the steaks, through the breading on the top, this means they are cooking. Once you see juices, you can flip the steaks over. Cook the other side of the steaks for another 5 minutes, or until both sides of the steak are golden brown. Remove from the oil and place on the wire rack. Place the baking sheet with the steaks in the oven to keep warm. Continue this until all steaks are cooked. To prepare the gravy, determine how much grease is left in the pan, we need 1/4 cup. You can always pour the grease into a glass measuring cup to verify that you are using 1/4 cup. Just be sure to use a slotted spoon to scoop out all the bits of steak that came off during the cooking, so this is used in the gravy also. With 1/4 cup of drippings in the skillet, add the flour, salt and pepper. Whisk this together. And let the flour mixture cook over medium heat for about 4-5 minutes. Carefully stir in the milk to the flour mixture. Whisk until smooth and no lumps remain. Let gravy simmer about 5-8 minutes until it thickens.Taste and add more salt or pepper as needed at this point. Serve steaks warm with gravy over top. Home cook, photographer, mother and lover of food. I love taking simple ingredients and creating delicious meals or sweet treats that the entire family will love, all with a hint of Texas charm.